The MARTA board of directors voted Oct. 4 on $2.7 billion in allotments under the More MARTA program, including $350 million for the Clifton Corridor Transit Initiative, a proposed four-mile light rail line. Photo courtesy of MARTA. The MARTA board of directors voted Thursday to approve $2.7 billion in allotments under the More MARTA program, including $350 million slated for the Clifton Corridor Transit Initiative, a four-mile light rail line that would provide commuting options, decrease traffic congestion and improve sustainability in the Emory area. The Clifton Road corridor serves over 40,000 employees, 15,000 students and 2 million patient visits per year. Nearly 50,000 cars pass through the area each day, according to estimates from the Clifton Corridor Transportation Management Association. The light-rail project would help ease traffic congestion and provide transit access for thousands of workers who cannot easily reach Emory, the Centers for Disease Control and Prevention, Children’s Healthcare of Atlanta and the VA, while also making it easier for Emory students and faculty to travel to Atlanta communities for research, service projects and internships. As Emory supports efforts to increase public transportation through the Clifton Corridor Transit Initiative, the university continues to offer a robust Commute Alternative Program. Emory began addressing the need for these options more than 20 years ago, and their popularity and variety continue to grow, notes Adele Clements, the university’s senior director of transportation and parking services (TPS). 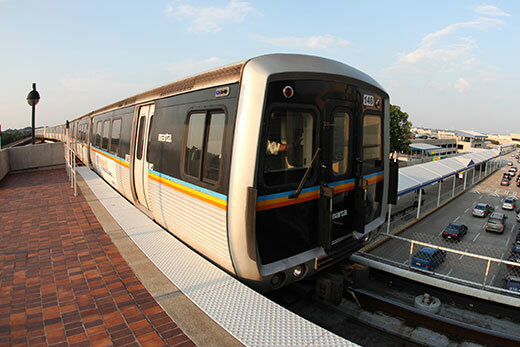 Options for alternative commuting include public transit (including MARTA, Xpress bus service, CobbLinc and Gwinnett County Transit), carpools, vanpools, biking or walking and Emory’s Cliff Shuttle system. To help employees figure out the options that will work best for them, Emory TPS offers custom commute planning, where employees can submit a request for a personalized commute plan. Emory also offers a carshare program for employees who use alternative commuting options but may need a car during the workday for off-campus meetings, appointments or errands. For public transit, Emory University will pay for an unlimited monthly pass. Emory Healthcare subsidizes it over 80 percent. For carpools, Emory heavily discounts parking, including free parking for carpools with three or more members. For vanpools, Emory increased the subsidy this year to $100 per seat each month. Emory also provides free parking at North or South DeKalb malls and a shuttle service to bring employees from their cars to campus. In addition to monetary perks, participants list multiple other benefits to Emory’s alternative commute options, such as lower stress, networking and helping support the university’s sustainability goals.